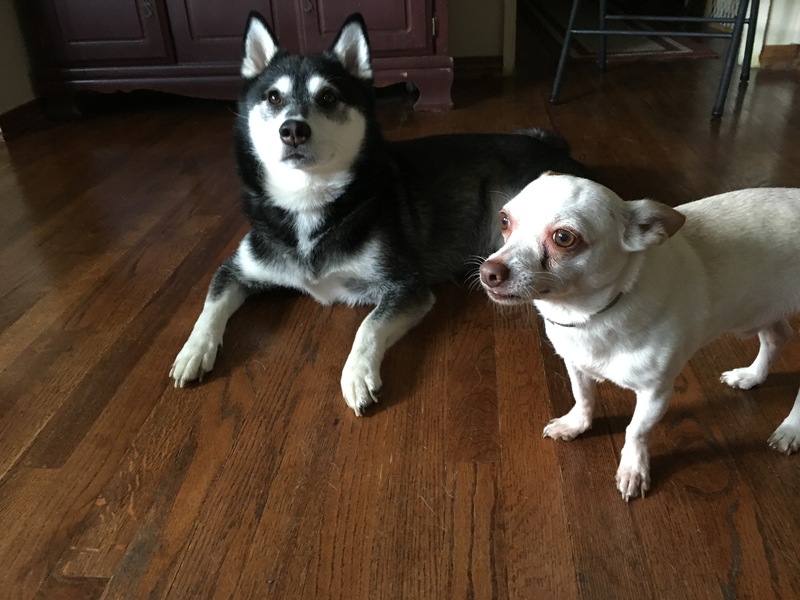 Gizmo is a four-year-old Alaskan Klee Kai who gets over excited, doesn’t listen to or always respect his guardians and pulls on the leash. His room mate Sam is an eight-year-old Chihuahua who gets nippy at times. But the main reason that the guardians set up a dog obedience session with me was to stop Gizmo’s infrequent attacks on Sam when over excited. Both dogs were very excited to see me when I arrived for the session. In fact they may have been a little bit too excited, LOL. Later in the session I showed the dog’s guardians a simple exercise they can use before taking Gizmo out on walks that will help him learn that an open door is not an invitation to run through. When I sat down with the dog’s guardians, I asked what rules and structure were in place. After we chatted about it for a couple of minutes, it became clear that the dog’s did not really have much structure. Many humans interpret adding rules and boundaries to dogs as being mean or as a negative. But because dogs go through life probing to determine where boundaries and limits are, a lack of rules in the house with multiple dogs can often result in confusion. By enforcing some rules and boundaries with good timing consistently, the dog’s guardians will be able to assume the leadership role in the dog’s eyes. This will be a necessary transition for the dogs to make in order for them to start seeing the humans as having things under control. The way things are now, I’m pretty sure the dogs think that they need to work things out themselves. It was pretty obvious this was the case when I pointed out that Gizmo showed absolutely no respect for the guardian’s personal space. For dogs, distance can equal respect. If a dog climbs up on top of you or gets all up in your business without an invitation, it’s a good indicator that it does not respect you as an authority figure. I spent a couple of minutes going over some nonverbal communication cues that the guardians can use to communicate that they disagree with the dogs when they get too close or violate any of the new rules or boundaries. Just as we were wrapping up that conversation, Gizmo decided to invade the personal space of one of his guardians. This gave us a perfect opportunity to put what we had just learned into practice. Because Gizmo did not cooperate on the leash and like to pull, his guardians did not walk him as often as they would like. I also added a Martingale collar as Huskies and Klee Kai’s have smaller heads and wider necks. This often results in collars that pop off at the worst possible time. Many dog trainers suggest a pinch or prong collar in these situations but I do not believe in using those as long term use has been found to cause stress and anxiety in dogs. Gizmo’s guardians had incorporated a harness because of this problem. But a harness is about the worst thing to put on a dog that likes to pull as it makes it easier for them to do so. I showed the guardians how they can incorporate a special twist of the leash to the Martingale collar to stop Gizmo from pulling. Once that was in place, we headed out for a walk. At first, Gizmo’s guardians were a little bit slow with the timing of the corrections and the intensity was not appropriate to the dog’s energy. But after a couple of minutes of practice, Gizmo started to get it. By the time we switched to the second guardian, Gizmo was walking in a nice heel position next to them with minimal leash corrections needed. This sort of leash training can go a long ways towards helping the guardians feel more comfortable about taking the dog for more walks. The more walks that Gizmo gets, the better his behavior in the house with Sam will be. A tired dog is usually a well mannered one. I believe that Gizmo’s redirected aggression towards Sam was a result of having too much pent-up energy, not seeing the humans as authority figures and being over excited. Now that the guardians know how to disagree with unwanted behaviors and how to incorporate rules and boundaries to help the dogs see them as authority figures, it should be easy to keep them from getting over excited or any redirected aggressive interactions. As the dogs gravitate into a followers mindset, it will no longer seem appropriate for them to handle things on their own (like Gizmo correcting Sam). This should help Sam feel more comfortable and confident around Gizmo and help Gizmo keep himself under control.